The owners of Denver’s Vape & Play, the city’s second licensed designated consumption area, bootstrapped $500,000 to invest in their business, which they plan to open in November. Winning social consumption license applicants in Las Vegas – where draft regulations are being reviewed – could spend a half-million dollars or more to become licensed and operational, one industry insider said. In West Hollywood, California, a social consumption business could be a multimillion-dollar investment when you factor in property acquisition, design and product development, one applicant reported. Those are steep investments on businesses that haven’t proved they can turn a profit. Moreover, investors so far have shown tepid interest in social consumption businesses. Only time will tell whether the gamble was worth the return. But social consumption company owners and license applicants insist these businesses aren’t as risky as they seem. “There’s a large group of people who want to enjoy cannabis socially, and I think this market is largely ignored because there are no profitable businesses out there,” said Taylor Rosean, Vape & Play’s co-owner and director of operations. Private residences are often the only places for people in adult-use markets to legally consume marijuana. That doesn’t work in tourist destinations such as Las Vegas, “where (the law says): ‘Come buy our marijuana, but don’t consume it anywhere,’” noted Scot Rutledge of Argentum Partners, a Nevada government affairs and marketing firm. But social consumption businesses are “uncharted waters,” Rutledge said. That has made it difficult to attract traditional investors and venture capitalists, who are waiting to see how social-use spaces fare, Rosean said. “It’s a very nontraditional business plan, and in many ways, we’re pushing the boundaries of what people thought cannabis (businesses) would look like,” he said. A social consumption space’s success will depend on a city or state’s regulations on product offerings and consumption methods – and a business owner’s ability to create an experiential space, said Geoff Sugerman, the chief compliance officer for Groundworks Industries, a vertically integrated cannabis company in Oregon that is applying for a social consumption license in West Hollywood in California’s Los Angeles County. “Like every component of this industry, you’re going to have some people who succeed wildly at social consumption (businesses), and some people will have a much more difficult time of it,” Sugerman said. 2. Some municipalities’ rules make it difficult to monetize social consumption – like in Denver. The Mile High City’s strict regulations for social-use licenses will make it problematic for businesses there to succeed, said Amanda Ostrowitz, the co-founder/CEO of CannaRegs, a Denver-based online cannabis legislation tracker. “The ability to monetize (social consumption businesses) is going to be extremely challenging in Denver,” Ostrowitz said. It speaks volumes that there are only two licensed designated social consumption areas in the city. Zoning regulations make it difficult for business owners to identify property for social consumption spaces. 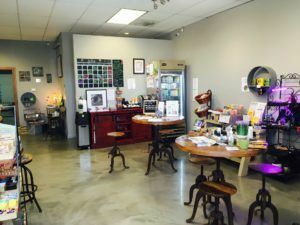 An example of the city’s exacting regulations include the fact that officials rejected a would-be “cannabis spa and lounge” because it would have been 19 feet too close to a child-care center. Applicants must provide proof of occupancy to qualify for a license, meaning they pay to occupy a space while they wait for their permit to be awarded. Applicants must have support from neighborhood associations where they plan to operate. The state’s Clean Indoor Air Act makes it unlawful to smoke indoors in public places, so smokable flower cannot be consumed on the premises, limiting consumers to oils, concentrates and edibles. Social consumption businesses cannot sell marijuana or alcohol, making it more difficult to generate revenue. Colorado Gov. John Hickenlooper vetoed a bill in June that would have allowed dispensaries to offer tasting rooms – eliminating a potential profitable model for social consumption in Denver. 3. Certain states and locales may be social-use MJ forerunners. Draft regulations for social consumption cannabis licenses in Alaska, Las Vegas and West Hollywood are more business-friendly, industry watchers said. The $1,000 application fee and $2,000 annual renewal fee for a dispensary in Alaska to create an on-site social consumption area is relatively low. Las Vegas’ draft regulations would allow social-use businesses to sell beer and wine containing less than 11% alcohol content. West Hollywood’s draft regulations would allow the businesses to co-locate with a dispensary or sell cannabis and MJ-infused food and beverage products. 4. Identify additional revenue streams. Denver’s Vape & Play’s owners are optimistic about consumer demand for social consumption spaces, but they’re hedging their half-million-dollar investment by creating additional revenue streams. They developed and patented a multistation vape bar they plan to make commercially available to other social consumption businesses, and they plan to offer consultation services to prospective licensees. For social consumption businesses that are not allowed to sell marijuana, it’s important to create additional revenue streams, Rutledge said. Beer and wine sales, food and nonalcoholic beverage sales, and live entertainment options could help. A retail store with a consumption lounge could be a more lucrative venture, Groundworks Industries’ Sugerman said. The Coffee Joint, Denver’s first licensed designated consumption area with an adjoining dispensary, hasn’t profited since it opened in March, but it wasn’t designed to be a stand-alone business, said co-owner Rita Tsalyuk. It was intended to be an entertainment, cannabis education and consumption space that complements Tsalyuk’s three dispensaries, including one next door. Also reported that it is helpful when mixed with alcohol and taken orallyy was quite effective, pain killer. Perlowin’s experience certainly makes hiim a top authority for the industry, along with a top advocate for it. Hemp Has Numerous Food Uses – Hemp seeds frdom the hemp plant have several food uses. Nice work Joey P. This is a bleeding-edge topic. Great coverage. Appreciate You!